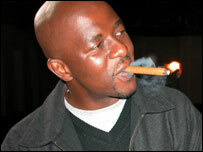 South African director Zola Maseko has won the top prize at Africa's premier film festival, Fespaco 2005, held in Ouagadougou, Burkina Faso. 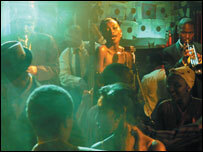 His film Drum is set in Johannesburg's Sophiatown district amid the jazz clubs and bars of 1950s. It centres on a determined reporter and his clashes with the apartheid regime. "This is an honour for South African people - their resilience in overcoming one of the most brutal regimes of the last century," Maseko said. The hero of Drum is the fun loving, hard-drinking philanderer, Henry Nxumalo, a magazine reporter. Nxumalo's enterprising reportage leads him into direct conflict with South Africa's apartheid machinery with fatal consequences. The leading role is taken by African American actor Taye Diggs. Maseko was awarded the Etalon d'Or de Yennenga or the Golden Stallion of Yennenga, and a cash prize of 10m CFA francs ($20,000) at the end of the week long film festival. Second prize went to the Moroccan film, La Chambre Noire, a film about the tortures and extra judicial imprisonment in 1970s Morocco. It was directed by Hassan Benjelloun and is based on real events inspired by the book The Black Room written by Jaouad Mdidech. Tasuma Le Feu, a comedy by Burkinabe director Kollo Sanou carried the third prize. It tells the story of an elderly ex-serviceman, Tasuma, who fought for France but was still waiting for his pension years later. Fed up with waiting Tasuma holds the district administrator hostage and forces him to dictate a letter to French President General Charles de Gaulle - who unknown to Tasuma is long dead. The three films were among the 20 shortlisted feature films in competition at this year's festival. Drum is only the second English language film to have won the grand prize at the African film festival since Heritage Africa by Ghana's Kwaw Ansah won the award in 1989. South Africa's participation at this year's festival had raised high expectations and many observers will not be surprised that Drum, which is one of four South African entries on the shortlist, has won.